Was “The Trust” an “A” or “M” type deception? Explain. 20 points “The Trust” was an M-Type deception, described as a misleading type of deception. The Trust was also known as the Monarchist Union of Central Russia and the organization was in operation from 1921 to 1928. 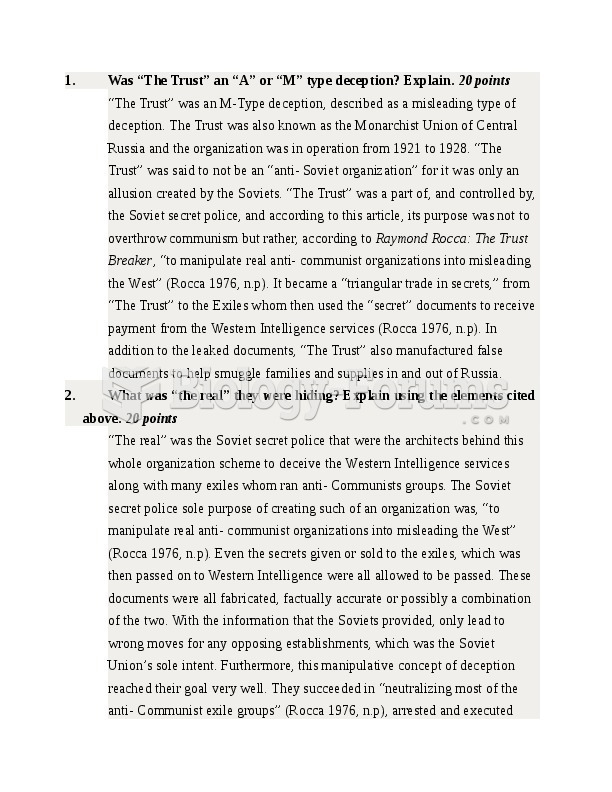 “The Trust” was said to not be an “anti- Soviet organization” for it was only an allusion created by the Soviets. “The Trust” was a part of, and controlled by, the Soviet secret police, and according to this article, its purpose was not to overthrow communism but rather, according to Raymond Rocca: The Trust Breaker, “to manipulate real anti- communist organizations into misleading the West” (Rocca 1976, n.p). It became a “triangular trade in secrets,” from “The Trust” to the Exiles whom then used the “secret” documents to receive payment from the Western Intelligence services (Rocca 1976, n.p). In addition to the leaked documents, “The Trust” also manufactured false documents to help smuggle families and supplies in and out of Russia. What was “the real” they were hiding? Explain using the elements cited above. 20 points “The real” was the Soviet secret police that were the architects behind this whole organization scheme to deceive the Western Intelligence services along with many exiles whom ran anti- Communists groups. The Soviet secret police sole purpose of creating such of an organization was, “to manipulate real anti- communist organizations into misleading the West” (Rocca 1976, n.p). Even the secrets given or sold to the exiles, which was then passed on to Western Intelligence were all allowed to be passed. These documents were all fabricated, factually accurate or possibly a combination of the two. With the information that the Soviets provided, only lead to wrong moves for any opposing establishments, which was the Soviet Union’s sole intent. Furthermore, this manipulative concept of deception reached their goal very well. They succeeded in “neutralizing most of the anti- Communist exile groups” (Rocca 1976, n.p), arrested and executed several people such as Sydney, Reilly, and Boris Savinkov, whom lead anti- Communists, and in the process of this goal, received enough payment from the secrets sold to finance the Soviet intelligence for many years. What was “the false” they were showing? Explain using the elements cited above. 20 points “The false” was the whole organization known as “The Trust” itself. Everything was fabricated to deceive any of the anti- Communist affiliations about the weaknesses and the change in governmental system of the Soviet Union. The individual that presented himself towards other groups, Aleksandrovich Yaushev, that he was a Soviet official whom and many in loops within the Soviet Union, foresaw that “communism was infeasible in Russia” (Rocca 1976, n.p) was a sham just become a part of the groups who were anti- Communist. The secret documents that were passed onto the anti- Communists were generally falsified information created to mislead the oppositions intelligence agencies, which only helped the Soviet Union if anyone wanted to strike. Overall, the whole organization created by the Soviet secret police was all a misconception so that everything Soviet intelligence needed was presented along with many of its own perks. Did they “Invent” anything? Explain. 20 points The Soviet Union created many false realities, such as, falsified documents, the organization itself, and staged car chases and gun fights in order to make the reality they created more believable. Creating the organization was the first thing “invented”, this was the starting point for all things after. Though this is the biggest invention that the Soviet Union used, gun fights and car chases along with the documents they leaked created gave this fake reality credibility. Without each part of this working synergistically, it would not have been a success. The way I see it, this entire thing was one giant invention and each step played a part in making it more of a reality. Were decoys used? (don’t restrict your thought process to fake military equipment, think “dangle” or people used as decoys. Explain. 20 points There were many different decoys used. Again, the organization was the biggest decoy which proved itself to be an extremely effective decoy. Within the organization, the falsified information in the documentation were also path-alternating devices in which was used to drive opposing opinionated groups from defying the Soviet Union. The power to make false passports to smuggle people and supplies were a decoy to show an “alliance” with the anti- Communist organizations. The car chases and gin fights were staged decoys to take take away the possibility of doubt in western intelligence organizations. Finally the man who seemed to be running the organizations from 1921- 1928, Aleksandrovich Yaushev, was known as a “dangle, ” defined as “someone who feigns disaffection to his government and, like bait, is put in the path of opposition intelligence services” (Rocca 1976, n.p) was, aside from the organization, one of the greatest component used to deceive the many groups. References Rocca, Raymond. "The Trust Breaker." Diary Entry - Raymond Rocca: The Trust Breaker. February 6, 1976. Accessed March 15, 2015. http://www.edwardjayepstein.com/diary/rocca.htm.